Archie Haynes Mayton, 87, of Oak Ridge, passed away Wednesday, March 20, 2019 at his home. He was born February 4, 1932 in Coalfield, TN, the son of Harvey and Viola Liles Mayton. 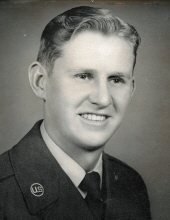 Mr. Mayton served with the US Air Force during the Korean War. He owned and operated Archie’s Barber Shop in Claxton for many years. Mr. Mayton was a long-time member of Mt. Pisgah Baptist Church. He enjoyed fishing and studying his Bible. In addition to his parents, he was preceded in death by son, Ronald Mayton; brothers Lewis Mayton, Harvey Mayton Jr, Henry Mayton and George Mayton; and sisters Rosie Beaty, Jean Woods, Cordelia Stout and Jackie Gibson. He is survived by his wife of almost 64 years, Janet Marie Mayton; Son, Michael Mayton and wife Megan of Fairmont, WV; sister, Louise Terry and husband Kenneth of Rockwood, TN; 4 grandchildren, Declan Mayton, Zachary Mayton, Sam Mayton and Sarah Fletcher and 2 great-grandchildren, Chasiti Fletcher and Kiera Fletcher. The family will receive friends on Saturday, March 23, 2019 from 11am – 1pm at Weatherford Mortuary. The funeral will begin at 1pm with Pastor Joe Olivio officiating. The burial will follow at Oak Ridge Memorial Park. Memorials may be made to the Mt. Pisgah Printing Ministry, 115 Old Hen Valley Rd. Oliver Springs, TN 37840. An online guest book can be signed at www.weatherfordmortuary.com. To send flowers or a remembrance gift to the family of Archie Haynes Mayton, please visit our Tribute Store. "Email Address" would like to share the life celebration of Archie Haynes Mayton. Click on the "link" to go to share a favorite memory or leave a condolence message for the family.